The Book Thief is set in war torn Nazi Germany, in the impoverished Himmel Strasse of Molching. A ten year-old girl, the protagonist, and her brother are sent to new foster parents, but the boy dies en route. Her new ‘Papa’ teaches her to read, and so develops a love of words, which will ultimately save her. She steals books to read to herself, and a Jew hidden in the basement, and those sheltering from bombs dropped by the Allied Forces. When I first picked up the book, I did not think that I was going to enjoy it. The voice of the narrator seemed a strange choice, slightly awkward, pedantic and somehow a bit soulless. It was only when I realised that it was Death that it made sense – and I was intrigued to read more. There is a tinge of genius in this choice of narration; the black humoured voice is clever. That said, I did not like the structuring of The Book Thief – the questions, headlines, summaries – I skipped reading them, as they added nothing to me, if anything, were slightly annoying. What I liked about this book was its ordinariness – the portrayal of the spoils of war from people on a very poor street, Himmel Strasse (ironically, Heaven Street). The narrator narrates in an uncomplicated way, mirroring the told experiences of Liesel Meminger, the protagonist. This edge of innocence is charming, in a kind of ‘good will save the day’ kind of a way, which seems to echo throughout the book. The characters are well drawn, and likeable, particularly ‘Papa’ and Rudy Steiner, Liesel’s best friend. Zusak pushes Liesel to the limits, and the degrees of tragedy and abandonment thrown her way are exhausting. It is no wonder that Death has a soft spot for her. Her own reactions become more shutdown, somehow. It is one way of coping with the levels of destruction, but, and here is a flaw for me; there is a lack of abject fear portrayed in the characters. It is war, after all. Can the folk of Himmel Street really be appeased by a ten year-old girl reading to them? I am still to be convinced. The Kindle Edition was particularly frustrating, for the book within the book and the story of The Word Shaker – it was too small on the Kindle to read and could not be expanded. I was able to stretch it on the iPad, but I’m not sure that it was worth it. It was a bit sycophantic, and not necessary in terms of character or plot development. A tighter edit here, for me, would have been preferable. 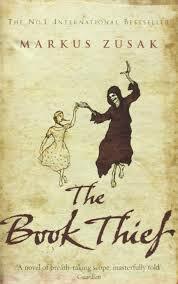 That said, The Book Thief is haunting at times, and some of the images have lingered long. The boy with the hair the colour of lemons receiving his kiss, at last, is very moving. Overall a book, that despite itself – the structure and necessary trimming – works. I read it through to the end, and it left me with some things to think about, which is a minimum that I ask for in a book.